I feel the need to complain/praise a few different things. What is up with this kid. Why is he such a creep and how is he not dead yet. I was over you being on the season because you are a nut job. I never actually thought youd be killed off and HOW ARE YOU A ZOMBIE?!? What is even happening to everyone now, is this real life? Id like to hear everyones thoughts on this because why are people dying and coming back as zombies, when theyve had no zombie encounters. MIND BLOWING. How is she going to raise a baby in zombie world. Totally dont understand it. She cant even keep track of the kid she has. 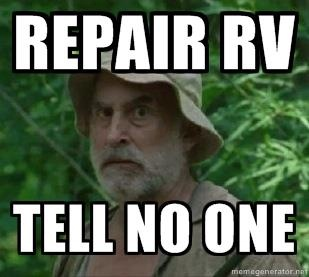 And Dale dies?! What the what?! Totally expecting the group to meet up with the guys they had a fight with at the bar. Theres not enough people now to have another season. And by the looks of the season finale coming up, a million people are going to die. I definately care way too much about this show. Who is as nuts about it as I am? p.s. all pictures are from here at the Laughing Dead.